And as I read Marshall’s “The Week-end”, I kept wondering if this is what May would have become had she never left Logan.Marshall I know primarily as the author of (not, as it ends up, a novel, but a short story collection), one of those books everyone in Mormon letters eventually hears of but few of us ever read. (Someone should bring out an ebook edition. Mr Marshall, if you’re reading this, I’m interested.) “The Week-end” is part of that seminal collection. The story is split into two point of views. The first is a third-person look inside Thalia’s head. The second is first-person—a female relation of Thalia’s (also in her mid-forties) who sees Thalia’s macro actions and applies an interpretation similar to those Carter’s family assigned to his Aunt May. In this case, that the long inactive Thalia has, out of grief from her mother’s death, abandoned her small rural Utah home for a hedonistic fling along the California coast. What her trying-not-to-judge relation does not understand is that Thalia, who has spent her adult life caring for her mother, has the longing soul of an artist. She want to paint! To write! Especially to write. Poems, in fact. Perhaps even a novel? Oh, “to open a magazine one day and find her name, in type not too large and maybe not so dark, in some small corner of the page”—it’s a modest dream, but it fills her soul with an ache larger than Ephraim, Utah can hold. I’ll pause here momentarily to note the italics in that quotation. The third-person in-Thalia’s-head portions of this story are italicized, whereas the first-person portions are staid, straight lines. Not an accident, I’m sure. Anyway, her dream has a specific goal, “beautiful words [that] had called to her each time she saw them written, a far-away whisper of sea and cypress, luring her on: Carmel-by-the-Sea.” So she takes her meager savings (after a bus ticket and a $14/night Monterey hotel she has $229.37 leftover) and shyly tries to belong to this seductive, artistic, alien, ocean town. To me, the miraculous success of this story is how it makes me—an ambitious and endlessly-disappointed-with-my-current-success artist—feel for Thalia and her modest goals and dreams. And to cheer for her successes which, in my own life, would count as dismal failures. the hollow stillness of its rooms . . . suddenly almost uncomfortably and unnecessarily large. Yet Thalia was surprised how the house . . . now seemed different to her for its very smallness and for the uncanny impression of maximum occupancy, not spaciousness, that pervaded the four rooms, pushing at the yellowing papered walls and crowding the dark corners filled with ceramic knickknacks and tinted photos in their dusty cardboard frames. . . . What should have been conspicuously missing from the house now suddenly seemed overwhelmingly present. Thalia loved her mother. She never regrets losing her life in another’s service. But now that her mother is gone, she is finally free to be Thalia. She has escaped her waiting place. Regardless of what others assume, Thalia has found peace. She has had her week-end. I was thinking a bit this weekend about how pity is its own form of passing judgmental, since we’re making a judgment that someone else’s life or situation is worse than it should be. Not that we shouldn’t “mourn with those that mourn,” but we need to be careful not to push people into mourning who aren’t actually there. To me, the miraculous success of this story is how it makes me–an ambitious and endlessly-disappointed-with-my-current-success artist–feel for Thalia and her modest goals and dreams. And to cheer for her successes which, in my own life, would count as dismal failures. It’s an ongoing reminder to take people on their own terms and not impose our life’s values and templates on them. Anyways–I like this story and I think it really speaks to a certain place in Mormon culture. I wonder if that place doesn’t exist anymore and if we’ve outgrown it, or if there are still members of the church with these kinds of attitudes. I wonder the same thing. I’m pretty far removed from my rural roots now — I haven’t been back since 2004 — so I really don’t know. I remember the first time I saw the internet in my aunt’s house and the feeling of loss I experienced. I think that world may indeed be gone—or nearly so. Which, nicely, is a large part of our next story by Lewis Horne. As I was thinking about this more last night, I wondered about the elements of this story that we often see as Mormon, and how we are often ashamed of our rural, isolated, small-minded, weird, cultural heritage. And yet, I wonder how substantially different growing up in a rural Mormon place in the 1960s was from growing up in a small Lutheran town in Minnesota or a small Baptist one in Minnesota? 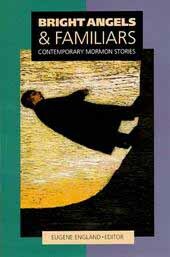 I know Don Marshall is known as a Mormon writer, but those things that we often see as “Mormon” in his work don’t really seem all that unique to our religion to me. Mid-century Utah was a kind of quirky place, but why is it ‘weird’ and somewhat embarrassing, while books about mid-century rural Southerners like The Secret Life of Bees or mid-century midwesterners like Peace Like a River, get all the good press? Because we haven’t forced the nation to look us in the eye yet? That book will be written and marketed correctly and read. For what it’s worth, I’m really not a big fan of quirky Southern books like The Secret Life of Bees or Saving CeeCee Honeycutt, but at least they have a national presence. I guess The Lonely Polygamist is the best we can get when it comes to quirky (and it’s actually pretty darn good). Reading this (playing catch-up again), it reminded me a lot of Garrison Keillor — especially the non-italics parts, much of which I could actually hear in Keillor’s voice as I read it (the one where he gives the news from Lake Wobegon). Which is certainly a compliment, in my view. It’s interesting how the exotic is inherently what we don’t know. To many of us as readers, the rural Ephraim shown here is probably more exotic than Carmel-by-the-Sea. Does Thalia recognize this? Maybe, by the end. This strikes me as a story that is only coincidentally Mormon. But that’s not a weakness, in my view. It could have been told about a character from any suitable background — but Mormonism *was* the background it was told within. We need stories that are uniquely Mormon, but also stories like this one where Mormonism just happens to be the setting. On a different note: fantastic comment by Katya (#1). Accepting that other people may be content with a life we find unsatisfying is a challenge I think many of us struggle with. Next Next post: What of the Night?